Welcome to the 58th issue of the SHAPE Journal, a new collection of papers continuing Jim Schofield's recent research into the significance of the Solar Wind for Substrate Theory. A recent crack in the Earth's magnetic field unleashed a magnificient auroral display over Norway. There seems to be increasing evidence that the Solar Wind does periodically enter our planet's Magnetosphere, and may, somewhat paradoxically, even be responsible for it. Since this issue was written, and while we were “going to press” as it were, some interesting evidence came to our attention which may support the notion that the Earth’s magentic field was originally ‘seeded’, and continues to be supported by the Solar Wind. There’s some really intriguing, and seemingly holistic science going on in this area of physics - but further research is required to work out its veracity and its significance to our own theories regarding magnetism and the Universal Substrate. 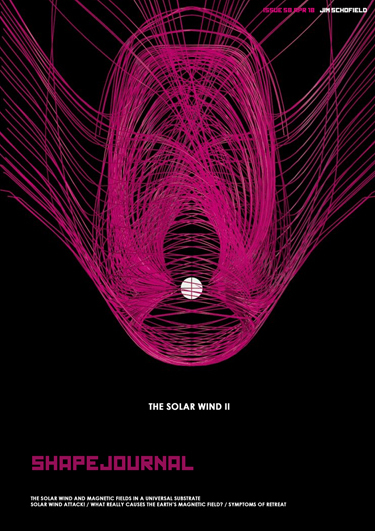 Watch this space: The Solar Wind III is already in preparation.